A warning for pickup truck drivers in Pinellas County tonight, as thieves could be targeting you. Thefts are reportedly on the rise for Ford F-250 and F-350 models. PINELLAS COUNTY, Fla. — A warning for pickup truck drivers in Pinellas County tonight, as thieves could be targeting you. Thefts are reportedly on the rise for Ford F-250 and F-350 models. 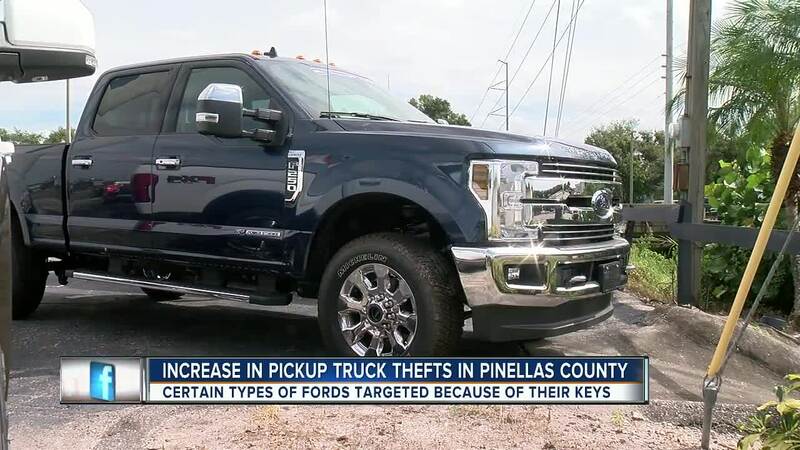 According to Pinellas County Deputies, on Sunday, October 14, a 2004 diesel Ford F-250 truck was stolen in the residential area of North Hercules Avenue and Rountree Court in Clearwater. The truck was locked but the suspect was still able to steal the pickup. Detectives are warning citizens of a recent increase in thefts of Ford F-250 and F-350 diesel pickup trucks between the years of 2001 - 2010. Deputies told ABC Action News, they have seen at least 15 of these thefts so far this year. Sergeant Spencer Gross suggests safety measures which include a steering wheel lock, installing an alarm on your vehicle, and installing a GPS tracking device.